Return to Audubon Springs Reviewed! Check out this lovely review of Return to Audubon Spring on The Divas of Desire. She really captured the essence of Emma and Rafe’s relationship and struggles. 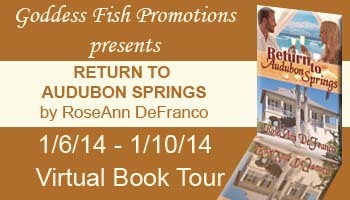 This entry was posted in Giveaway, Return to Audubon Springs, Reviews and tagged Return to Audubon Springs, Reviews, RoseAnn DeFranco, The Divas of Desire. Bookmark the permalink.